You are here: Home / Book Giveaway / And the Winners are….. 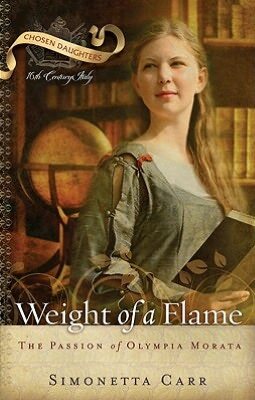 I am delighted to inform you of the following providential winners of the “Weight of a Flame: The Passion of Olympia Morata” book giveaway contest…. Please send an email to christinalangella@me.com with the mailing address to send your book. I’d like to thank each and every one of you for joining. If you would like to keep up with Simonetta as she continues her blog tour, click here to see the schedule. And I almost forgot! Be sure to return on January 30th, 2012 when I post my review! Yippee!! Oh,thank you so much, Christina! I might never have known about these wonderful books if you hadn’t done this interview. May God richly bless you for your servant’s heart. Much love to you! Congratulations! I think I am as excited as the winners! I might never have known about you and your wonderful blogs if I had not “met” Christina. Thank God for his providence. I am looking forward to knowing you better. I hope you enjoy the book. Feel free to contact me if you have any questions as you read. Thank you so much Simonetta! I am so grateful to have met you and to have been given the opportunity to feature your work. I can’t wait to start reading my copy and to post a review at the end of January. May God continue to bless you and the work of your hands — you are a true blessing to the body! And, congratulations to the winners! Hooray for the winners!!! I am SO excited 🙂 Thank you, thank you, thank you! I’ll be reading this with my 8 year old daughter. I’m not sure which one of us is more excited! Blessings and love to you!